Many people thought Anthony Joshua is looking ahead of his fight against Eric Molina and into the super fight against Wladimir Klitschko. Well, Joshua's dominant victory over Molina would beg to differ. Joshua defeated Molina via TKO in the third round to retain his IBF heavyweight title, just seconds after Joshua knocked down Molina. Here is an excerpt of the finish from Fightful's live viewing party of the Joshua vs. Molina fight. 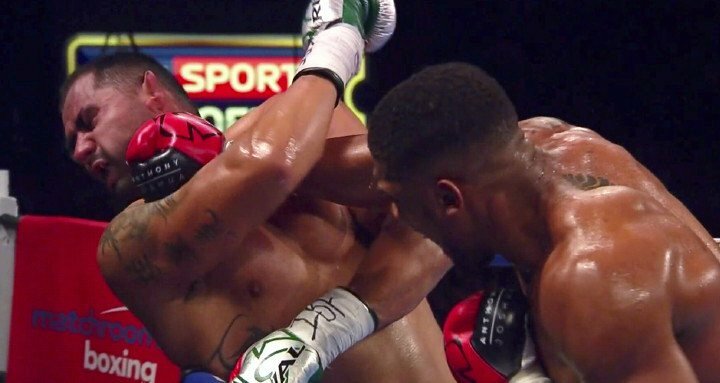 Round 3: Joshua picks up the pace with a stiff jab to Molina's head. Molina is being overly cautious in the fight so far. Joshua gets close and tries to attack the inside with body shots, but Molina is just looking to clinch, not even counterattack. Joshua knocks down Molina with an insane left jab to the temple of Molina. Once he gets back up, Joshua just punished Molina until the referee stopped the fight. ANTHONY JOSHUA was patient and then vicious as he put away Eric Molina with ease to set up a blockbuster clash with Wladimir Klitschko next year. Anthony Joshua beat Eric Molina at Manchester Arena to retain his IBF heavyweight title. The IBF heavyweight champion was never expected to be troubled by the American and he wasn't. This was as simple as everyone thought it would be, but it was job done in impressive fashion. It was over in round three as the Watford man mountain floored Molina with a right and then when he somehow beat the count, he forced referee Steve Gray to step in after a brutal combination. IBF heavyweight champion Anthony Joshua (18-0, 18 KOs) made easy work of #8 IBF challenger Eric Molina (25-4, 19 KOs) in stopping the reluctant fighter in the 3rd round on Saturday night at the Manchester Arena in Manchester, England. Molina, 34, was absolutely not interested in fighting tonight, as he did zero in terms of throwing punches until being stopped in the 3rd round. Joshua dropped the 6’4″ Molina with a right hand to the head in his corner. Molina made it back up at the count of 8. Joshua then finished Molina off with a three-punch combination that resulted in the referee Steve Gray halting the fight at 2:02 of the 3rd round. The way that Molina went down from the knockdown in the 3rd, he looked like he had no interest in getting up at all. He just saw there on his backside in the corner after getting dropped. Frankly, I was surprised that Molina even bothered to get back up, because he looked totally disengaged mentally, as if he didn’t want to be there tonight. Heck, Molina had the same look on his face when he entered the ring at the start of the fight. I saw no fire in Molina’s eyes tonight. He just looked totally scared.